Digital marketing is not only the future, it’s the present. But do today’s marketers have the skills they need to operate in a digital world? New research by The Boston Consulting Group shows that they do not—and that the gaps and shortfalls are bigger than companies assume. The signs for the future are even more troubling, as many marketers seem focused on catching up on yesterday’s needs rather than embedding into their organizations the capabilities and expertise that will be required tomorrow. The companies that act now to transform their marketing capabilities will be much better positioned to connect with their customers in the years to come. Marketers know that digital channels are critical to engaging today’s consumer. Global spending on digital advertising will reach $178 billion in 2016, almost 30 percent of total ad spending, according to eMarketer. Digital advertising already represents a third of all ad spending in the U.S. today, and many forecasts see digital reaching parity with TV in a few years’ time. In the UK, almost 60 percent of consumers use social media each week for an average of 52 minutes per day. In Germany, about 13 percent of all commerce is now transacted online or via mobile devices; online sales are growing at more than 20 percent a year. Worldwide, a quarter of consumers use smartphones, a percentage that will rise to a third, or some 2.5 billion people, by 2018. In developed economies, of course, the percentages are much higher. With the rapid growth in digital spending and the expanding impact of digital channels on consumers’ behavior, it’s more important than ever for marketing organizations to understand where and how they can most effectively influence consumer behavior and whether they can do so efficiently. Google commissioned BCG, supported by digital-training experts The Knowledge Engineers and a team of marketing industry organizations (see the Acknowledgments for a list of the organizations involved), to assess the current state of digital skills in marketing organizations. The findings outlined herein were discussed with Google executives, but BCG is responsible for the analysis and conclusions. We surveyed some 1,100 marketers at 57 companies to understand how they rate their marketing organizations against digital-marketing best practices. Participating companies were from the retail, consumer products, financial services, and technology, media, and telecommunications industries, as well as from public-sector, education, and not-for-profit organizations. We focused the survey on companies in the UK and Germany, two highly developed economies that are following different trajectories with respect to digital’s economic impact but that together broadly represent the current state of the digital market in developed Western nations. 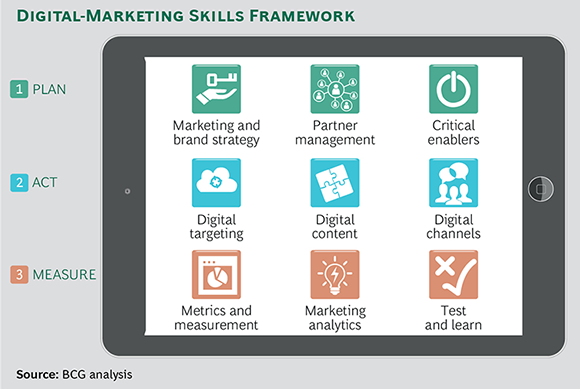 We asked marketers to assess their organizations’ capabilities across a digital-marketing framework that includes nine categories of skills. (See the exhibit below.) The first three categories are related to planning: marketing and brand strategy, partner management, and critical organization enablers. The next three involve execution: digital targeting, digital-content development and distribution, and expertise in seven digital channels (search, websites, display media, mobile advertising, mobile Web and applications, social media, and video). The final three sets of skills relate to measurement: metrics and measurement, marketing analytics, and testing. Marketers rated their teams’ current capabilities and performance in each skill and in each of the seven digital channels on a scale of one to six. Responses were turned into an index with 100 equaling best practice. We also asked respondents to list the capabilities that are critical for business success in the medium term (three years) and the skills in which they need learning and development support in the next 12 months. The results are eye-opening. On BCG’s 100-point Digital Capabilities Index (DCI) (with 100 indicating best practice), the average digital-skills score for all marketers was 57. While a few companies ranked higher than 70, the majority fell squarely into the 55-to-60-point range. (See Exhibit 1.) Industries such as retail and financial services were particularly weak. On the one hand, these scores should be a wake-up call for CEOs and CMOs of any customer-facing organization. On the other, the current state of play is not that surprising, given the relative youth and rapid development of digital marketing in general. Companies face the biggest shortfalls in some of the most important capabilities—skills related to mobile, video, testing, partner management, and organizational enablers, for example—which will only increase in importance in the next several years. At the moment, at least, marketers are not singling out these skills as immediate or longer-term learning and development (L&D) priorities for their teams. Moreover, in many instances, companies do not see these critical skills as top near-term business priorities. The scale and nature of the skills gaps suggest that companies need to do much more than tinker with their recruitment and training programs. Most require a transformation in their marketing functions: making the development of digital capabilities a top business priority, rewiring the organization accordingly, and significantly boosting L&D programs to produce the needed skills. In addition to championing digital engagement, top management must deliver resources, support for new initiatives, and investment in capabilities and platforms that capitalize on the opportunities digital technologies offer. In L&D specifically, companies ought to shift their focus to support an agile marketing organization characterized by self-learning (in addition to more traditional training), an adaptive strategy based on the test-and-learn approach, and much more calculated risk taking. This is a big undertaking—and an equally big opportunity for those that seize it first. The playing field is mostly even; research shows that most companies face broadly similar gaps and needs. Since the DCI rates companies against best practice, there’s plenty of room for improvement. Even companies at the top of their industries have major gaps in critical capabilities. Better talent will lead to better business performance. Moving now and moving quickly can deliver long-lasting improvements in both skills development and the marketing organization’s ability to drive top-line results. Given the shortage of digital talent, and the time it takes to revamp L&D programs and push the results through large, multilayered organizations, those companies that get a head start will have a huge opportunity to accelerate ahead of their peers and build sustainable long-term advantage. The digital capabilities of today’s marketing organizations vary in quality by individual skill, channel, and industry. (See Exhibit 2 and the Appendix.) Moreover, there’s a big dichotomy between skills related to leadership, strategy, and planning and those necessary for effective execution. Take one example: marketers give credit to senior leaders for emphasizing the importance of adapting marketing to a digital world (a score of 74 out of 100 on the DCI), but access to technology platforms to make the most of consumer data—a basic but essential necessity in today’s digital marketplace—garners a score of only 47. Marketers do a number of things well. They believe they have the ability to connect diverse sets of data on consumers to better understand motivations and behaviors (a score of 70). Companies are good at sourcing and using a variety of digital content (72). With the exception of the retail industry—which scored 61, drawing down the overall average—marketers think they are generally successful at translating marketing objectives into actionable metrics (69). Marketers are relatively clear about the role that websites play in the consumer journey (69), and many believe their websites can do more to serve differing customer needs (58). Marketers also feel they have a relatively good understanding of the role of social media in the consumer journey (66), although they need to do more to create a consistent voice for each brand across various platforms (60). Public-sector, education, and not-for-profit marketers feel they do an especially good job with social media (71), much more so than marketers in retail (56), technology, media, and telecommunications (64), and financial services (57). But look more broadly and more deeply, and a different picture emerges—one that shows marketing organizations largely unprepared for digital, particularly with respect to evolving technology. While senior leadership gets high marks for support (74), the grades for structure and talent fall mostly in the low- to mid-50s. Scores for investing in new capabilities that address a changing marketplace (53) and for developing marketing platforms that make the most of customer data (47) are especially low. Companies see themselves as developing content well (63), but they fall short on distribution and, especially, on making content relevant to where consumers are in the purchasing journey (49). Respondents from public-sector, education, and not-for-profit organizations and from technology, media, and telecommunications companies think they perform reasonably well on marketing analytics and on metrics and measurement; not so for those in the consumer products, financial services, and retail sectors. Testing received some of the lowest scores in the survey from marketers in all sectors and was especially low for consumer goods companies, with a score of 45. Even more telling, perhaps, is where marketers see themselves with respect to various digital channels. The relative strength in websites and social media falls away quickly when marketers are asked to rate their capabilities in video (a score of 49), mobile advertising (40), and mobile Web and apps (48), scores that should be cause for concern at a time when consumers are increasingly on their smartphones and watching videos. Video. Scores were particularly low (38) in the use of technology to keep consumers engaged with a brand. Mobile Advertising. This capability received low scores across the board, with the lowest assessment being on the use of location data in mobile campaigns (36)—one of mobile’s most beneficial attributes for marketers—and a low score on the use of data to determine the right spending levels for mobile (38). Display Media. Advertisers have a serious shortfall of talent in the fastest growing and most important area of display advertising: programmatic advertising using real-time bidding (41). Testing. In an increasingly data-driven function, one of the basic skills of an agile marketing organization is the ability to test, learn, adapt a campaign, then test again. But few advertisers use online channels as a testing ground for offline channels (a DCI score of 34). Partner Management. Marketers are less than sanguine about the capabilities of their agency partners and about the relationships they have with these suppliers. Many do not believe their creative or media agencies are at the cutting edge of digital marketing. They have trouble working effectively with their agency partners and challenging them to get better results. Partner management received a DCI score of 54. Marketing staff are frustrated by the level and quality of the training that they have available. They gave their employers an average score of only 46 for offering “a very effective and impactful learning and development program for digital marketing”—less than halfway to best practice. The retail industry scored especially poorly (39), but none of the sectors we surveyed scored over 48 on this topic. Digital training materials are seen as neither up to date (45) nor easily available when they are needed (51). Organizations are not effective at facilitating sharing of best practices (50), and they do not allow staff sufficient time to build their digital skills (47). L&D programs scored slightly higher in the consumer goods and in the public, education, and not-for-profit sectors, but the overall average was only 49. Looking to the Future…or Living in the Past? The situation does not appear set to improve in the near term. If marketing organizations are not well prepared now, they will be even less digitally capable in the future—especially in the channels where demand for up-to-date skills is likely to be greatest. One might expect that the areas with big skills gaps, such as those discussed above, would be targets of concerted attention going forward. Yet when we asked marketers about their top L&D priorities for the next twelve months, video scored 43; mobile advertising, 37; display media, 27; and testing, 44. There are several explanations for this disconnect, including the possibility that many marketers do not have a good grasp of the importance of newer digital channels (which would also be a troubling indication of the degree of their engagement with consumers). Whatever the reason, the data clearly indicates that many marketers seem to be living in the past rather than looking to the future. They are not putting a priority on developing or improving the skills that correspond to impending areas of growth; as a result, they risk being left behind or even out of the game. In the fast-developing digital-marketing environment, backward-looking or reactive approaches to L&D will almost certainly fail to deliver the talent that companies need, especially considering the lead times required to embed new practices in the daily practice of large, multilayered organizations. Among the many skills and channels that appear to be in danger of receiving insufficient attention, the following are some of the most important, given current market trends. Mobile Advertising. The UK Advertising Association reports that spending on mobile advertising in the UK grew almost 60 percent, to £1.62 billon, in 2015. According to eMarketer, UK mobile advertising accounted for 30 percent of a total £7.3 billion in digital spending in 2014; it expects mobile advertising to become the single largest ad channel this year and to claim 40 percent of total paid media spending in the UK by 2018. Globally, mobile ad spending will reach $75 billion in 2017, according to ZenithOptimedia. Marketers feel they perform poorly at mobile advertising—and they consider it of low business importance (43) and a low priority in terms of L&D (37). Mobile Web and Apps. The situation is slightly better for mobile website and app development, but not by a lot. This channel scored only 48 for current performance, 56 for business importance, and 50 as a top-three L&D priority—at a time when Internet access on mobile devices has surpassed access on PCs, according to comScore. The primary experience with the Internet for an entire generation of consumers in the developed world—the 16- to 34-year-old Millennials, who outnumber the baby boomers and have a far greater degree of technical sophistication, appetite for consumption, and desire to be connected—is mobile. The vast majority of the world’s population lives in developing markets, where the Internet experience is and will continue to be mostly mobile. Video. Online video presents a similar dichotomy between market reality and marketer priority. The IAB UK reports that mobile video-ad spending rose 142 percent to £164 million in 2014, more than a third of total video-ad spending of £442 million (a 43 percent increase from 2013). Similarly, a recent IAB survey found that more than two-thirds of all advertisers expect to increase digital video-ad budgets in the next 12 months. Globally, Statista estimates that online video-ad spending will grow 18 percent in 2015 to some $10 billion. Nonetheless, video received very low scores for importance (44) and priority (43), with some exceptions in consumer goods and financial services. Display Media. Our research has shown that for display advertisers and their agencies, digital display campaigns that employ programmatic, or automated, buying of advertising placements can achieve big gains in performance—an average 32 percent improvement in cost per action—and in some cases, improvements of more than 50 percent. (See Improving Engagement and Performance in Digital Advertising, BCG Focus, September 2014.) But to achieve these gains in large-scale campaigns, advertisers need to take advantage of the potential to experiment and learn online and make effective use of individuals with advanced digital skills. It does not bode well when marketers rank their current display-media skills at only 49 and the priority they assign to improving these skills dead last (22) among the capabilities and channels we surveyed. Testing. One of the great benefits of digital technology is the ability to test just about anything with consumers quickly, easily, and inexpensively—from ad copy to campaigns and offers. In pricing, for example (a complementary function to marketing), the ability to test, learn, and adapt in real time is the basis for dynamic pricing, which, pioneered by Amazon and others, has helped upend the retail business. Marketers, however, are slow and inconsistent in determining how and to what extent to test. Few place a priority on developing their testing skills (44)—a serious oversight or miscalculation, in our opinion. Other Skills. Marketers give some digital skills, such as marketing analytics, digital-content creation, and digital targeting, higher marks for business importance and skills development, but even these scores (which fall into the 55-to-65 range) trail the realities of the marketplace. Big data, branded content, and targeting consumers for advertising delivery based on digital behavior are three of the biggest trends in marketing today. Other key skills, such as partner management and metrics and measurement, score even lower for importance and as an L&D priority. The current talent gap could easily lead to a vicious circle, especially for those companies that are slow to address their shortcomings. Marketers that cannot attract, develop, and retain staff with advanced digital skills risk falling behind, since talent in today’s increasingly transparent marketplace is quick to recognize companies that do not measure up. The reverse is also true: talent attracts talent. Companies that commit themselves to transforming their marketing operations into agile outfits, with L&D playing a front-and-center role, have the opportunity to market themselves as go-to destinations for digital talent. Those companies that transform their capabilities first may be hard for others to catch up with. No company should underestimate the challenge. The research, which our experience confirms, shows that many organizations require a broad transformation of their digital capabilities just to stay in the game, much less lead the field. This means both upgrading basic digital skills, such as website management, search, and digital targeting, and rapidly developing more advanced skills, such as data analytics and testing, in channels such as mobile and video. But it’s not enough to address individual skills. Marketing organizations need people who appreciate the strengths and shortcomings of each channel and can marry this knowledge with a comprehensive understanding of the consumer journey, supported by technology to make use of the ever-increasing amounts of data available. The goal for forward-looking companies should be not only to “follow the consumer” but to get ahead. Given where many companies stand today, this is a tall order and will likely require a broad corporate commitment to a multiyear journey. In theory, companies can choose to build or buy talent, but in practice the current imbalance in supply and demand means that acquiring talent from outside is both difficult and expensive. For one thing, it’s never easy for nontechnical people, such as those who staff most HR departments, to assess technical skills. Moreover, in a fast-developing field, the best people want to work close to the cutting edge, in an environment where their skills are challenged and their efforts are recognized and rewarded. They will expect much more comprehensive training than what many companies’ “lunch and learn” programs can provide, as well as training tied to specific roles and career paths within the organization. Companies that are not good at digital marketing today are doubly challenged—they will find it proportionately more difficult to attract digital talent than companies that are already performing well. Candidates today use an array of digital tools, including social media and specialized job-seeking sites such as glassdoor.com, to research prospective employers. It’s simple to find out how well a company measures up—and easy to move on if it doesn’t. Most marketers need to rebuild their learning and development capability. The first question a company should ask itself is whether its L&D plans, as currently constructed, will help it to close the digital-marketing skills gap—or whether they are just set up to do more of the same. Many organizations need to reassess their priorities through an evidence-based approach, one that not only reflects internal requests but also provides an objective assessment of where L&D investment is actually required. To find talent for newly defined roles, more and more companies are no longer looking at grads with marketing degrees or people with branding backgrounds. The need for technically proficient and specialized staff is leading companies to new talent pools. Demand is rising for data scientists, Ph.Ds, econometricians, mathematicians, agency managers, and media professionals. Marketers are hiring more people who have worked in nontraditional roles in digital and branded content as well as in media companies. As with many other things, where you start depends on where you stand, and companies should not try to address all their digital-skills gaps at once. Nor should they shy away from the time commitment this kind of step-change involves. Most marketing organizations can benefit from doing five things. Start with a strategic vision and roadmap. Companies need to identify early on the role that digital marketing will play in fulfilling business objectives, and this will help dictate the marketing platforms and capabilities that will enable them to better connect with consumers and create competitive advantage going forward. One consumer products company, for example, chose digital as the key to building competitive advantage for its brands because its assessment of the competitive landscape and the company’s financial resources showed little opportunity to win in traditional channels. The company established digital channels as a clear business priority, with the goal of becoming “the most advanced digital company in the marketplace.” This set the company on a multiyear journey: expanding its digital knowledge and capabilities, increasing digital spending, and embedding a digital-first mind-set throughout the organization. Understand the real gaps. Understanding what and where the gaps are between current performance and best practice—and how these gaps compare (or quite possibly contrast) with current L&D priorities—is an essential step. Advertisers looking to get a comprehensive assessment of their digital-marketing skills and how they compare with those of their peers can participate in the annual Talent Revolution survey, developed with the assistance of more than 30 advertisers, agencies, and marketing experts to help companies assess what they currently do well and where they can improve. Focus on today and tomorrow. The fast-evolving world of digital marketing requires marketing organizations to expand the focus of their L&D programs—and their marketing efforts generally. It’s no longer sufficient to optimize training and execution for today; forward-looking companies look to the future while fixing current gaps. Above all, their revamped learning programs need to be agile and able to evolve over time. Companies should think in terms of a roadmap rather than a snapshot solution; L&D programs need to be as fluid as the digital marketplace and to continually incorporate new technologies and applications. For example, while one team addresses shortcomings in Web search, another team can be looking at the challenges in social media. And when the upgrading effort moves on to social media, an advance team can be exploring mobile. Mandating a rising percentage of total spending on digital each year can help the entire organization learn by doing. Make a step-change in L&D. Changes in L&D should support a broader transformation in capability and focus. L&D is not only for digital specialists; most companies will need to expand the universe of executives and staff targeted for digital training. For a digitally oriented culture to take hold, all levels of the marketing organization, from the CMO to marketing assistants, need to be engaged. Content can and should be customized, but the importance of developing enhanced digital skills needs to be reflected across the entire organization. One European company requires marketers to attend 24 mandatory training sessions a year—which means essentially a session every two weeks. Our research shows that across all industries, the quality of digital L&D is seen to be wanting. Engaging, relevant, and memorable content is essential for any training program; it is all the more important in a technical field such as digital. Not everyone needs to know how to design a programmatic advertising platform, for example, but every marketer today needs to be conversant in how programmatic exchanges work and the advantages they bring to both advertisers and publishers. Similarly, performing data analytics or digital targeting requires a high degree of technical expertise and training, and marketers need to understand and appreciate the role these capabilities play in today’s marketing programs. Business and marketing teams need to be involved in the design of training programs and to play a role in program development. Off-the-shelf materials can be helpful, but customized, industry- and company-specific content will also be necessary. The pace of digital change is such that traditional training approaches will not keep an organization current. Companies need to foster an acceptance of and appreciation for self-learning, promoting ongoing learning as a basic responsibility of staff and executives at all levels. As with other key enablers, leadership from the top can play a critical role. Increasingly, we see top management going through digital-leadership programs with their entire teams in order to lead by example and seed a culture of continual learning. Enable a broader digital transformation. Revamping L&D may not be sufficient by itself. Rethinking the marketing organization more broadly may be necessary. For example, some companies may want to centralize marketing functions for greater control and efficiency. This can also make it easier to transform marketing initiatives into agile cycles measured in weeks rather than months. In addition, companies can create digital centers of excellence to facilitate sharing of best practices and promote digital education and adoption. Adjusting marketing’s interface with other corporate functions, such as legal, finance, and HR, is also critical to the effectiveness of an agile organization. No company will have all the skills it needs in-house; transforming how marketing collaborates with an expanding universe of agency partners is another critical component. No one can predict how digital technologies will evolve or how they will affect consumer behavior in the future. But it’s easy to see the digital-skills divide expanding between companies that have committed themselves to developing the marketing skills they need—and are consequently looking to the future with confidence in their capabilities—and those that are struggling to catch up. Much of the difference will be determined by which companies embrace the talent revolution in digital marketing now.